The Affordable Hardwood Cremation Urn designed and crafted from furniture grade hardwood plywood with a 1/8" cherry, oak, or walnut veneer. Rosewood is a dark stain on cherry plywood. The Rosewood is a darker finish than the cherry but still has a red tone. Cremains are loaded through a bottom opening panel that secures with screws. It is very important to keep the cremains in a sealed plastic bag inside the urn. 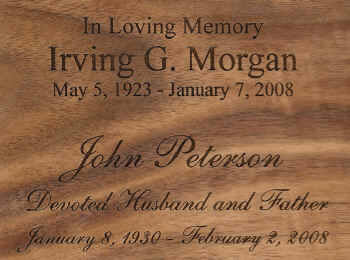 Engraving is available on the front or top of the urn; please specify the engraving location. Please limit each line of engraving to no more than 35 spaces. Be sure the spelling, punctuation, capitalization, and dates are correct; you will not receive an engraving proof. Holds 5"x 5"x 6" temporary cremains container.